Perhaps you have noticed that the outdoor stairs at Rockmont are not exactly straightforward. Hickory Hill is a great example of what has become an authentic Rockmont stairway style. The stairs on Hickory Hill are an adventure, meandering across and around the hill, reminding some of the Swiss Family Robinson and others of Hogwarts. Our stairways make you feel like you’re walking in the trees. 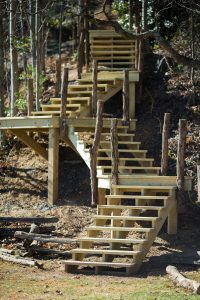 We started building stairways above the ground in an effort to beat erosion, but Cole Smith, one of the camp owners, wanted the constructed part of camp to look as wild and wonderful as the natural part of camp, so he built stairways and walkways that followed the contour of the mountain. You might notice that very few of the walkways are simple rectangles, and the treads traverse the mountain like a fox’s trail. The handrails are locust posts from our own mountain, and Cole likes to pick ones with branches pointing off the trail into the woods. One of the best examples of the Rockmont stairway style is at the Hemlock Tribal area.The walkway narrows around a Sourwood Tree below cabin 22 and then widens toward the creek. Sourwoods also like to lean and bend unpredictably, and our walkways are their perfect companions. We are replacing all three zip lines this year as part of our regular maintenance, and we decided it was time for a new path to the top of the zip line. You will be glad to know that you no longer have to run to canoeing to take your harness back to the top, but you still won’t run straight up the hill. You will follow a playful wooden trail, up, over, and up some more until you arrive. The point is not just to get there quickly. It is to enjoy the whole way there. The Hickory Hill Challenge: How many stairsteps do you have to climb to get to Cabin 16 from the base of Hickory Hill? Submit your guess (or maybe you know from experience) to info@rockmont.com. Make sure to include your name (and say hello) AND answer this tiebreaker question: How many stairsteps do you have to climb to get to Cabin 17 (using the right fork)?